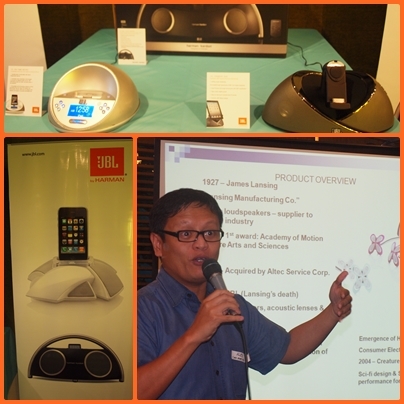 Last December 5, bloggers gathered together to experience gadgets on a different level. Bloggers Night: Brands That Click 2011 were held at Astoria Plaza in Ortigas, Pasig City and attended with almost 50 people including bloggers, brand representatives and supporters. We had a chance used and explore the products of brands participated the event and bloggers were so eager to used them and have a first hand information on brands like Archos, Asus, BenQ, CoolerMaster, JBL, Kingston, Razer, Sandisk and PowerColor. Then the formal presentation of brands with thier newest products occurred and presented by their respected representatives. 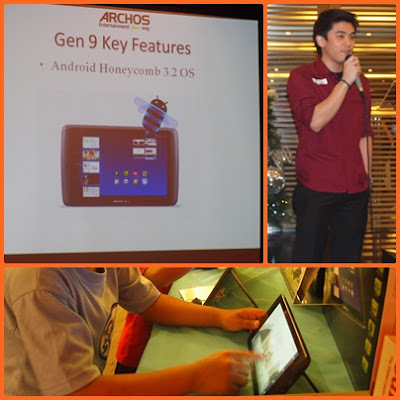 Like Sir Gelo, for Archos which having their new set of products available in the market such as Archos G9 Tablet Powered 3.2 Andoid 3.2 Honeycomb with 10.1" and 8" display, 1.5 GHz dual core A9 OMAP 4 ARM Cortex processor, up to 250GB HDD memory and good thing about it is its a 3G android ready which you can pruchase the dongle separately without buying a brand new unit again to upgrade your preferences. It will sure "Entertainment Your Way" with Archos. 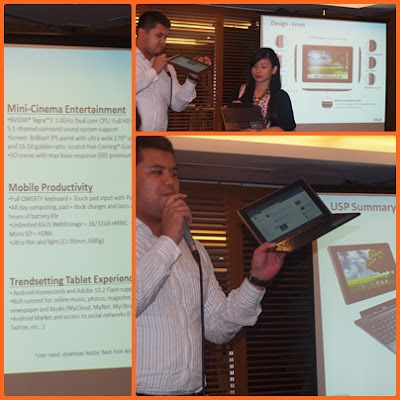 Then Asus representative gave a short talk about their product - Asus Eee Pad Transformer. This gadget also awarded as the Gadget of the Year and Design of the Year at 2011 Stuff Gadget Awards. For me, it is more practical way of having a gadget since its like a convertible car which you can use with of without keyboard on this one. If I will have a budget or gathered monetary gifts this holiday, Asus Eee Pad Transformers is one on my list hehhe..I even tried it and its so easy and comfortable to use. They have an ongoing promo this holiday season, wherein you'll be having your early gifts from Asus if to purchase a desktop and notebook. 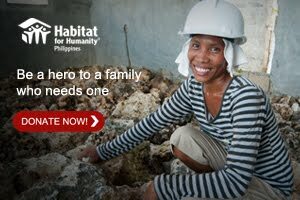 Visit their nearest authorized reseller stores in Metro Manila. Sandisk a well-known brand of storage and you can rely with its leadership quality and innovation. Did you know that Sandisk cards is very durable, even if you dip it into the water it still functions well. 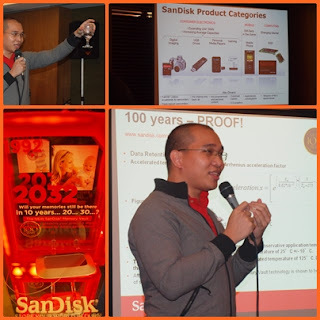 Now they Sandisk have a new product called Sandisk Memory Vault presented by Sir Peter, with a capacity of 8GB and 16GB, USB 2.0 connection via USB. This product is design to retain your files for almost 100 years wow..isn't it amazing storage of your memory photos and files than relying on somewhere else? JBL by Harman in its almost 65 years of producing great audio electronic devices also present at the said event and it presented by Sir Alex. From realistic sound that produced by their products, JBL goes with the flow of new technology through out years and the designs evolve as well to cater people from all walks of life. 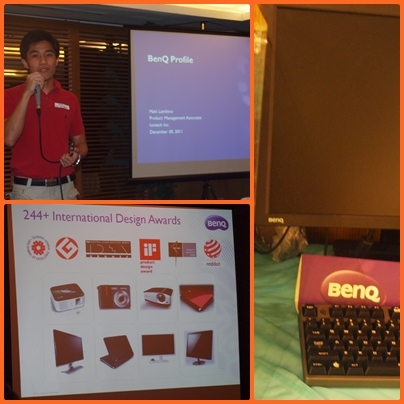 BenQ which stands for the company slogan "Bringing Enjoyment and Quality to Life" is discussed by Sir Maki. From one company to 16 BenQ really evolve tremendously with high quality and service for their consumers. With their major achievements that accumulated 244+ international design awards and now with their LCD Monitors?LED which known through out the world. In between and after each discussions, bloggers were so excited and the night was full of enjoyment because they raffled of almost 30 gadgets came from the brands that joined the event like JBL speaker, Asus mouse, BenQ monitor, Asus video card, PowerCooler Vortex, Sandisk Mem Vault and many more...no bloggers went home empty handed yeayy...that was so much fun...Thank you so much Vincent Haoson of Back2Gaming.com for this opportunity, until then :)). 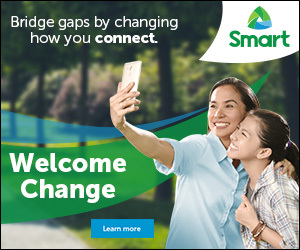 Learn to use all this cool new technology with computer classes.